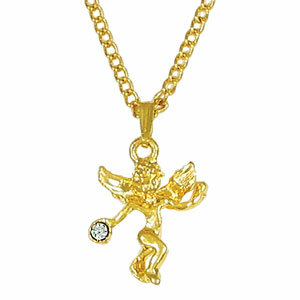 Beautifully petite Gold Cherub Angel Has a clear sparkling brilliant CZ stone. This lovely pendant measures 11/16 inches including bail. Fancy jump style bail. Necklace comes with an 18 inch gold light curb link necklace, and has a spring ring clasp. Can be used as April birthstone. This necklace was bought for a gift and was very appreciated. Very good value and great item!